The IEEE 802.11p/1609 protocols define the provider service and the user service. When a communication device enables the provider service, it sends WSA (WAVE Service Advertisement) broadcast packets on the control channel to inform nearby devices about the service information. The information mainly include service type and used service channel. When a communication device enables the user service, it keeps receiving WSA packets to check if its desired service is announced on those packets. If it is positive, the device joins the service and changes its communication channel to the assigned service channel to start using the service. In this example case, we arrange a Road Site Unit (RSU) to enable a provider service while we let two cars enable the same user service to join the service provided by the RSU. Thus, during the simulation, the two cars join the same service and change their communication channel to the same service channel so that they can communicate with each other on that channel. 1. Click here to download the configuration files of this demo case. 2. Click here to download the EstiNet free trial version. Please click here to query quotation. The IEEE 802.11p/1609 protocols define the control channel service. When this service is activated on a communication device, the device must immediately change its communication channel to the control channel if it is operating on a service channel. The device stays on the control channel until the control channel service is deactivated. The control channel service can be applied when some emergency messages have to be delivered to all communication devices quickly. Activating this service stops all operations on all service channels and makes all devices turn back to the control channel to receive emergency messages. In this example case, we arrange a Road Site Unit (RSU) to enable a provider service while we let two cars enable the same user service to join the service provided by the RSU. Thus, during the simulation, the two cars join the same service and change their communication channel to the same service channel so that they can communicate with each other on that channel. In addition to the above two services, we also let the two cars activate the control channel service during the simulation time from the 5th second to the 10th second. Thus, during this period, the operations on the service channel are stopped so that the communication between the two cars is cut off. The IEEE 802.11p/1609 protocols define the WAVE Short Message (WSM) service. This kind of short message is used to broadcast important or emergency information, such as lane reduction or car collision situation. A WSM can be transmitted on the control channel and the service channels. When a car receives a WSM, it checks the PSID (Provider Service Identifier) carried on the WSM to see whether it has activated the corresponding WSM service with the same PSID or not. If it has, the received WSM is then accepted and delivered to the corresponding application program for the following process. 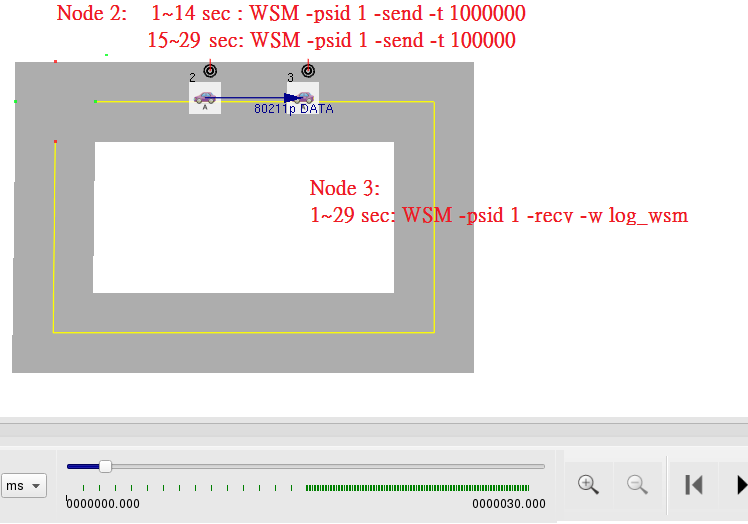 Thus, to perform a WSM service, the WSM receiver has to enable a WSM service with a specific PSID, while the WSM sender has to put that PSID into a transmitted WSM so that the target receiver(s) can accept the WSM. In this example case, we arrange two cars on the road to perform a WSM service. To let car #3 play the role of WSM receiver, we activate the WSM service on it so that its Media Access Control (MAC) layer accepts WSM’s during simulation. Besides, we arrange to run up an application-layer program, named WSM, to process the received WSM’s. To let car #2 play the role of WSM sender, we also arrange to run up an application-layer program, named WSM, to transmit WSM’s. Moreover, we set the car #2’s WSM transmission rate to be one time per second from the 1st to the 14th second and change the rate to be ten times per second from the 15th to the 29th second. 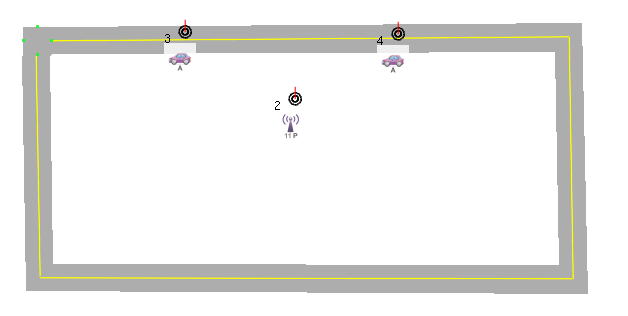 Thus, when playing back the simulation result, we can see the transmission behavior of different rate on car #2. In addition, we can check the WSM transmission and reception records in the log files that are generated by the application-layer WSM programs. Ⓒ 2019 EstiNet Technologies Inc. All rights reserved. Use this form to find things you need on this site.